Bear bile farms, where Asiatic black bears, also called moon bears, are kept in small cages in order to harvest bile extracted from their gallbladders, are often cited as the worst of the worst when it comes to animal welfare. But, thanks to a push for new synthetic alternatives to the substance, the heyday of bear bile may soon be behind us. 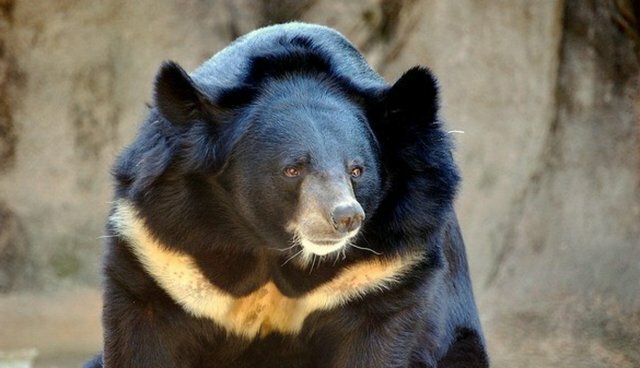 Valued for its ursodeoxycholic acid, an ingredient used in traditional medicine to treat a wide range of ailments from bruising to epilepsy, bear bile supports an industry that currently uses about 12,000 bears (sun bears and brown bears are sometimes used along with moon bears). In addition to sordid conditions and lack of medical care, the bears are subjected to excruciating extraction procedures. Interestingly enough, the company looking for bear bile alternatives is in fact one of the biggest players in the industry. KaiBao Pharmaceutical is a major outlet for industrial bear bile farms. But as public opinion has turned against the practice of bear bile farming, the company has developed a five-year plan to support alternatives and has even gained support from China's Ministry of Science and Technology. "The project aims to develop a synthetic bear bile bioequivalent in terms of chemical composition by using poultry bile and biotransformation technology and gaining the independent intellectual property rights. The project will benefit the protection and sustainable using of endangered medicinal animal resources and provide raw materials with stable and controllable quality for developing new drugs and bear bile powder products. These are of great significance for the history and development of traditional Chinese medicine." While it's not perfect (the new synthetic bile will be derived partly from bile from poultry), animal welfare advocates say it's a step in the right direction. "We welcome this decision and are in support of such measures that will replace bear bile with a synthetic alternative," said Jill Robinson, founder of Animals Asia. "Such a step forward is good news for the pharmaceuticals, for those who practice TCM [traditional Chinese medicine], and for customers too. We applaud the official backing of this research and believe it is good news for the bears and the millions of people who have campaigned for their freedom." Animals Asia notes that victory is still far away for farmed animals, bears included. But the shift in thinking is a novel one, and one that foretells a future where bear bile farming is only a memory.